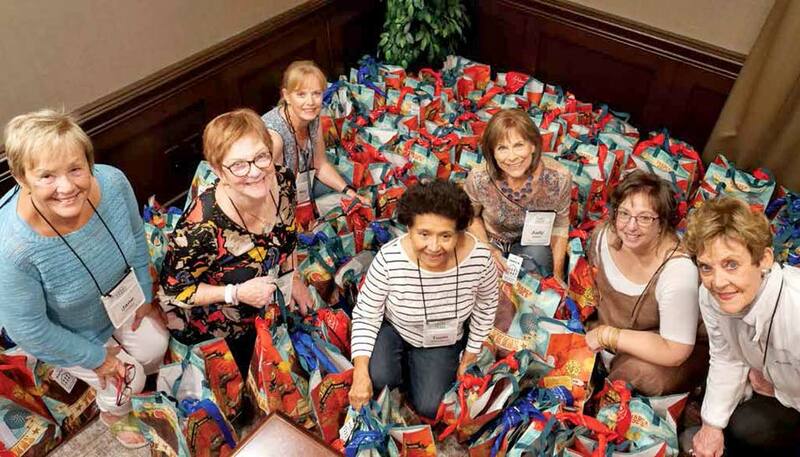 Members of the reunion’s “Décor/Bags/Prizes” team pose with some of 400-plus gift bags they prepared. From left are Jane Archer, Marcia Barham, Mary Dill, Tonie Maheshwari, Judy Walker, Vicki Jessich, and Sarah Garretson. Austin — A Saudi Aramco Annuitants Reunion with a “heart-of-Texas” flavor recently unrolled near Austin, Texas. The reunion featured unique activities such as trapshooting and longhorn steer riding, plus a trio of banquets — including a gala hosted by Aramco Services Company (ASC) as a “thank you” for the participants’ combined centuries of work at the enterprise — as well as another event dubbed the Chuck Wagon Buffet. The reunion, the 31st in a series dating back to 1958, drew 416 retirees and family members — the highest turnout in a decade. Reunion co-hosts David and Vicki Jessich, and Bill and Judy Walker promised an “exciting and fun-filled hafla,” offering “time to visit with old friends, make new ones, eat some good food, dance a tad, discover our corner of Texas, and have a little fun.” By all accounts, it was a brilliant success. 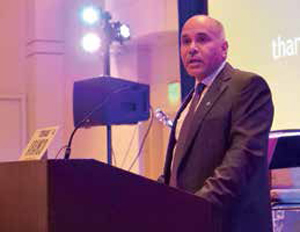 Khalid K. Al Mulhim, general manager of Government Relations, represented Saudi Aramco. Joining him were Basil A. Abul-Hamayel, ASC president and CEO, and Abdulrahman Al Bayounis, director of Public Affairs. Abul-Hamayel also underscored the strong links among annuitants. “Hafla is Arabic for a family party — the ideal description for a gathering of Saudi Aramco annuitants, their loved ones and friends,” said Abul-Hamayel. “There’s no better word than ‘family’ to describe the ties among Aramcons. “In today’s world, where things tend to be more about differences than similarities, it is uplifting to address a group whose friendships have endured the test of time and have brought two cultures together in a special bond. “You set a strong foundation for Saudi Aramco to grow, prosper, and flourish ... into one of the world’s leading integrated energy and chemicals companies. You represent the best of what can happen when people work together toward a common goal with mutual respect and integrity. Images of flood damage wrought by Hurricane Harvey in 2017 drew gasps from attendees. An accompanying video showed how ASC had stepped up to the plate by becoming a major donor, and through volunteer efforts, to help Houston recover after the disaster. Abul-Hamayel also highlighted Saudi Aramco’s efforts to anticipate global energy needs, and said the company is continuing to expand its renewable energy portfolio. Since the last reunion, General Electric has delivered the first wind turbine in Saudi Arabia — “a historic milestone in the overall national renewable energy target,” he noted. He also recognized the company’s research centers in Houston, Detroit, and Boston. In one breakthrough, researchers working with engine manufacturers have developed new designs without spark plugs to achieve “up to 37 miles per gallon in a Ford F-150 truck,” he said. a native Texas longhorn steer. The oldest retiree at the reunion was Johnnie Merritt, 104, who joined the company in 1948 and retired in 1972. She attended a screening of her oral history interview, conducted last year where she lives in San Antonio. Abul-Hamayel applauded both Merritt and Bert Seal, who worked in the Photo Unit in Dhahran from 1955-60, in his gala speech — Merritt for her seniority and Seal for his continued volunteer service shooting pictures at reunions. The oral history interviews with Merritt and Seal were among about a dozen shown at the reunion that brought emotional tears to the eyes of some viewers. Most of the interviews were carried out by the Archives section of the King Abdulaziz Center for World Culture (Ithra) at the 2016 reunion in Monterey, Calif.
Attendees also got a preview of the 2019 KSA Saudi Aramco Annuitants Reunion next March from Ali Baluchi, who spearheaded the previous three in-Kingdom gatherings of retirees. He said first-time returnees would find “dramatic changes” — partly because of their own work. Other special activities at the reunion included a short film about Ithra, and the screening of “Joud,” an Ithra-produced wheel-of-life film about the Kingdom.